Kamelot strikes back with their seventh album release. The American melodic / power metal band provide us again a masterpiece. 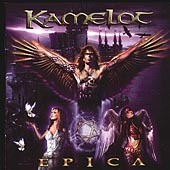 Epica sounds more progressive but of course the round and soft sound with all the symphonic elements Kamelot have habituate us, remains. The first thing someone notice about Epica is the structure of the songs, which is more technical than ever. The sound is very impressive, rich and more than well worked thanks to Sascha Paeth and Miro. Kamelot experiments with several not typical metal instruments, trying to enrich their sound with some not traditional power metal paths and I have to admit they get along with this. For instance the accordion part is a nice surprize and a different touch in the whole atmosphere. Again, Roy Khan at his best. The vocals are amazing, powerfull and crystal clear… meaning you won't need the booklet to read and understand the lyrics. Also the female vocals in one song were an interesting addition and fits perfectly with the result. The production touches perfection and the more you listen the album the more it grows on you, meaning the songs are not that catchy as it was in the past but full of details that the listener have to discover. Mystical, atmospheric, symphonic, melodic, majestic are just a few adjectives in order to describe the songs. Once again the musicianship is excellent, high above good and these guys raises the standards for the whole melodic Power/Progressive Metal scene. Epica is an album that will appeal to almost all melodic Power Metal fans around and one that will establish even more the band among the leading forces movement. For sure a worth listening and definitely buying album. The release date is January 13th, 2003 and I am quite sure this is one of the best album releases within 2003. Well done !! !